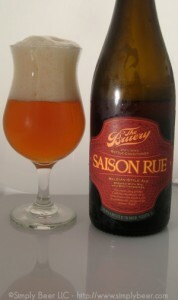 The Saison Rue is the first beer from The Bruery that has been reviewed on Simply Beer. I’ve heard good things about The Bruery and the Saison Rue came highly recommended from the folks at the Liquor Outlet in Boonton NJ. As soon as I read the label on this beer, I knew I had to try it. A Saison made with Rye and Brettanomyces; different can be good or it can go horribly wrong. Poured with a big thick giant head, highly carbonated, as it should be. What struck me about this beer was the orange copper color and very hazy. Exactly what the label on the bottle said I would get. This beer has a sweet citrus funk to it, slightly lemony with a hint of cardamon. I found the aroma very pleasing. When the base beer is a fairly mild flavored beer, such as a Saison, and you add such a dominate flavor such as the Brett yeast, you can really change the flavor profile of the style. The Saison Rue dominant flavor became the tartness of brett yeast as well as an apricot sweetness. I can only guess the apricot is coming from the hops. It did have a dryness to it that I would associate with the rye. As I’m writing this, I’ve almost finished the 750ml bottle and the flavor profile has stayed pretty consistent. Initial upfront fruity sweetness the transitions to a mild tartness, with a hint of spiciness. As I just stated, I’m almost finished this bottle. It is a nice refreshing beer. The 8.5% abv is nicely masked with the initial sweetness and tartness on the back end. As I have with several IPA’s, I like the brettanomyces yeast with this style of beer, but it did become a bit much by the end of this bottle. However, I would still recommend trying this beer for its complex flavor profile. Tasting Method: 750 ml Bottle.